Our facilities include the Learning Tower, our school library. It is much more than a traditional library: it is a place where diverse and varied ideas, thoughts and viewpoints flourish, where research as a life long learning skill is fostered. We believe that a school library is a hub of learning that should provide essential support for teaching and learning in the classroom. 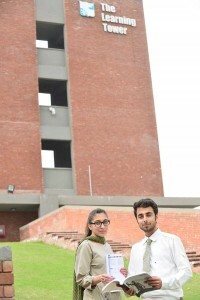 The Learning Tower is a three-storey building designed in such a way that it creates an environment where the students can engage in different activities that promote a love for reading and research. The Learning Tower houses over 23000+ books and reference material besides digital resource covering a wide range of topics. The ICT suite is on the top floor and has computers for research, multimedia projectors as well as dedicated space for robotics. It is a resource centre for both individual and collaborative work for Newlands students and staff alike. Library lessons are utilized for issuing books to students as well providing opportunities for different activities such as reading sessions, book review competitions, vocabulary games etc. In line with our mission statement, we foster international mindedness by celebrating international days and events such as International Peace Day, World Dignity Day, Mothers Day, World Book Day, which enable students to be aware of international issues, keeps them globally aware as well as providing hands-on learning experiences. At the Learning Tower we teach our students to respect and protect resources, have a strong sense of community, and increase their understanding of the world in which we live. It is our most powerful learning space when creating life-long learners.